Anyone looking to put out high quality woodwork knows the importance of precision tools. One easy way to make sure your work is at its best is by using tools that are square, level, and flat. Now it would be nice if all our tools came perfectly set from the manufacturer, but the fact is they don't, and the shipping process would most likely ruin the factory adjustments anyway. 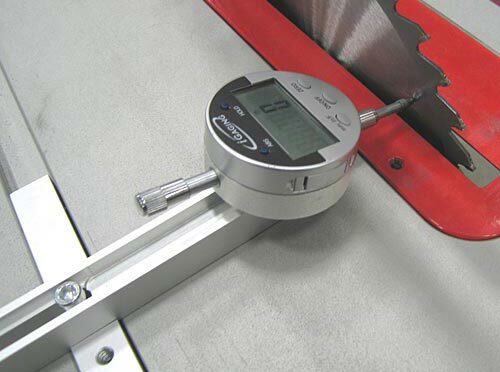 The DigiAlign from iGaging is a simple tool that takes a lot of effort out of adjusting just about any shop tool with a miter slot and even some without. The idea is to use the DigiAlign to help you correct any alignment issues between your miter slot and your saw blade, router bit, etc. Lets take a table saw for example: First you would want to use the DigiAlign to make sure your miter slot is parallel with your saw blade, then you would also want to check your miter slot with your rip fence. You can hardly beat the accuracy of .001” the DigiAlign offers. If you are up for a fun filled day of adjusting, you can pick up the DigiAlign for around 50 dollars.